I love this frame. However it's too brassy (orange) in color. I have to brush it with a thin layer of gold paint to tone it down (make it more golden yellow). It's a great frame and I highly recommend it for it's small elegant design. I would just ask that the manufacturer use a less brassy color when finishing it. 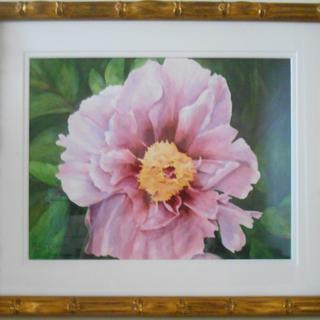 This frame is made for the painting of the tree peony. Everyone who has seen it has commented on how perfectly suited the frame is. P.S. In the added photo, the frame is cut off. Please let me know if, when you open it, the whole picture is there. What a great company to deal with! Great customer service. Easy to upload art to see how it looks in different frames. Quickly found the perfect frame. Great return policy. frames arrived in a couple of days. They supply all the hardware. And they are a Zero Landfill company. I highly recommend. What I was LOOKING for. Bright Gold on Bamboo for my Oriental paintings. The gold bamboo frame is beautiful and arrived quickly with all hardware included. I will definitely be ordering frames again. I was so happy with this purchase and the quality of the frame itself was excellent. It looks like it could cost easily twice the amount. I will be purchasing from them again. The color is off. Very orange and brassy. I had to completely refinish them. Hi Christine. Thank you for your review. We regret that the frame did not work as intended for you. We do offer samples of all our frames, excluding clearance, so that you can see and feel before you purchase. We have passed your feedback along to our team so that we can better represent the frame. We appreciate your business and hope to serve you better in the future! Overall the quality is good, price very reasonable but the color is more copper than gold. The website shows the color of this frame as gold. It is orange. When the frame arrived (packaging was excellent), I found it poorly put together. I wrote to request a refund and my request was handled politely and in a timely manner. In spite of my bad experience, I will give the company another chance. Hi Peter. thank you for your review. We regret to hear that you've had this experience. We appreciate the opportunity to make this right for you and to be able to serve you again. If there is anything else we can do for you, please let us know. Thank you again and have a great day! I ordered a different size and it was changed to larger so the picture isn't correctly in the frame. Also the bamboo on the corners dip doesn't match at all. Hi Gail. Thank you for your review. We regret to hear this frame did not work for you. We do have a 45-day return policy that our care team can assist you with so that you can find a frame that is best suited for our work. To avoid waste, we do not pattern match our corners. We look forward to talking with you so that we can find a resolution for your picture. We are in the office Monday-Friday 8am-7pm eastern time and can be reached at 1-800-332-8884. Thank you! Pictureframes. com is great. This profile is not. Extremely substantial frame. The profile looks more like a square plus bamboo on top of it. The “bamboo” starts probably an inch out from the wall. The color is also more orangey than gold. I see why it was on sale. Would be best for a very large piece. Hello Eileen! Thank you for your helpful review. 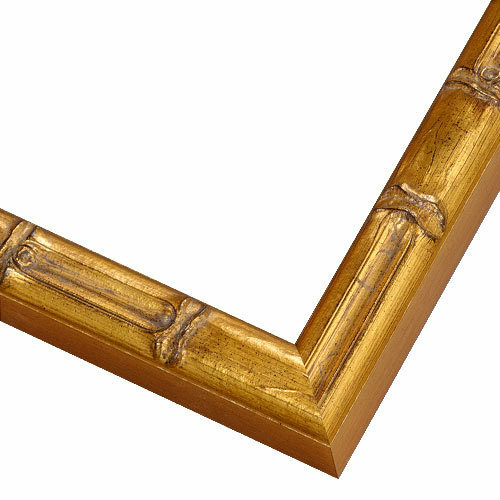 This exquisite frame has a very unique design. We encourage our Customers to order samples when exploring unique framing options. We are always open to allow you to exchange the frame if you are not %100 satisfied. Please give us a call at 1-800-332-8884 if you would like to discuss other framing options. Thank so much for your business! The color was an ugly brassy gold. I had to repaint it because it was so orange. I was also unhappy that when I first went to the website I was offered a 20% discount but it expired too quickly to use. Not fair with something that requires careful measurement! Hi Carol. Thank you for your feedback. We would love to make this right for you and have left you a voicemail to do so. Please give us a shout at your earliest convenience so that we can ensure we leave you nothing less than satisfied. Thank you again! I chose this because it will go nicely with my new beach print!! To match other frames for black and gold Chinese art work. I have 2 paintings with this frame, and my mom painted 2 more that makes a series of 4 that I will hang together. Love this frame. I have purchased the bamboo style frame before, and I loved it! I know it will enhance my cross stitch design. Because they have a good product and are extremely reliable and helpful, and most of the stuff is made in the USA. I picked this to frame album artwork in our Tiki Room. it compliments the base on my baker brand coffee table, both have a bamboo motif, and I have other things in gold in that room, it adds a little sheen to the look of a formal living room. I've been searching for bamboo frames to match others I purchased from a business no longer in service. This frame looks exactly like what I have. I especially like how easy it is to see what the frame will look like! Thank you. I can't wait! These frames are the perfect complement to my Palm Beach style. Gold bamboo frame perfect match with Asian cross-stitch artwork my wife creates. Framing some vintage botanical prints found at a tag sale. These frames are the right balance of traditional+vintage+eclectic. The picture is a Japanese wood block print. I had two other "bamboo" frames and I wanted to have the frames match. Because it has asian flair to it. I love asian pieces. It will compliment my tropical harbor print. I've ordered many frames from your company, and I've always been very pleased. Will a 28x38 hold a mirror? BEST ANSWER: We can created a framed mirror for you with this frame. If you are intending on framing your self then there are some special considerations regarding the weight and hardware used. Please let us know if you have any additional questions 1-800-332-8884. I doubt it. This is more suited as a decorative trim on a light weight print. I I have a 18 width/12 heigth picture. What size of frame do I need with the inside liner? Im assuming 20wide and 14 heigth??? Im so new to this..THANKS! BEST ANSWER: Hi Erica! If your image is 18 x 12, you will enter that as the artwork size. Since the liner will go around your image, the frame will automatically accommodate the overall size of the liner. There is no need to add or subtract anything from the image dimensions. I want to frame a 26"x26" x3/4" deep canvas will with frame fit it?? 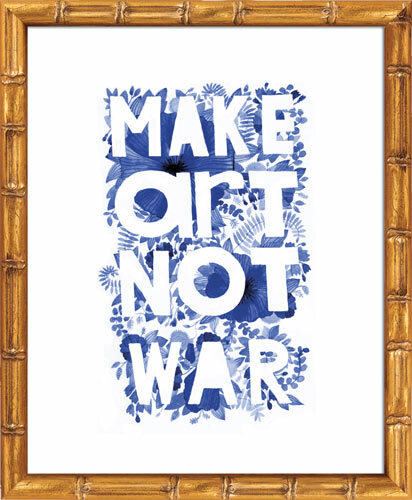 BEST ANSWER: Yes, this frame has a depth of 3/4" and will work with your canvas.